How can you encapsulate your whole persona and ethos in one little box? This was the challenge I faced when I signed up to the Perfect Strangers Project last week. 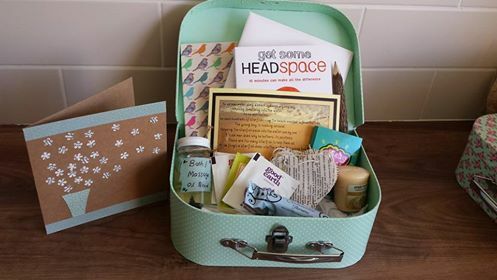 The premise is simple – you sign up and agree to create a gift box to send to a randomly partnered stranger, who has agreed to do the same. The spending guide is around £10, so creative thinking is the order of the day. Little did I realise what a challenge this would represent. With only a short paragraph of biography about my intended recipient, I scoured the “Inspiration list” helpfully provided. It was clear that the box should represent me; should provide some insight into how I live my life and what I consider to be important. But how to condense this down to a small box full of items? The task put me in mind of the “what would you take if your house was on fire” challenge, only this time, without the pressure of an imminent inferno, there was more opportunity to arrive at a well-considered selection; therefore, more pressure to choose a truly representative sample. Once that was done, the task became a whole lot simpler. Below is the summary of the contents that I sent to my Perfect Stranger, and I am wholly satisfied that this embodies the life that I live. I just hope she likes it as much as I do! Tea bags – my favourite teas, to help me relax and unwind, and to perk me up first thing in the morning. I usually wake at 5am and start the day with fruit or green tea…it’s pretty much downhill after that though and I revert to “builders’ tea” and end the day with a large glass of red – religiously! A candle – my favourite quote is “Better to light a candle than curse the darkness” (Eleanor Roosevelt I think…) and I have a candle tattoo on my left wrist to remind me of this. I find candles (especially smelly ones) are a real trigger for relaxation and often light one to meditate (see below) or before I start writing. Notebook – for quite a while now I have kept a gratitude journal (or, as my children call it, a “grateful book”, conjuring up mildly amusing images of a little book that is just happy to be alive and filled with pages!). Each day I write down three things that I am grateful for. Some days this is a chore and a bit of a struggle, so on those days I look to the most basic of luxuries – two arms, clean water… that sort of thing. There is always something, just some days I have to look a bit harder than others. A pencil (for writing in the book, I guess…) made from a Tamarind Tree branch. These trees are farmed for their fruit and the branches become waste products, so I love the idea that they can be reused and made into pens, pencils and something useful. Every little helps and all that. Massage/ bath oil – my own blend. I’d love to tell you I follow some fancy instructions but in reality I just chuck in a few drops of whatever I fancy with some carrier oil. This is a grape-seed base with some geranium, frankincense and rosemary. Nut free, in case you have allergies. Just add a glug to running water for a relaxing bath, or massage into skin. A Thornton’s Alpini bar – just because they are delicious. It has just occurred to me that if you are allergic to nuts, this is no good for you, but they are so yummy it was worth a gamble! 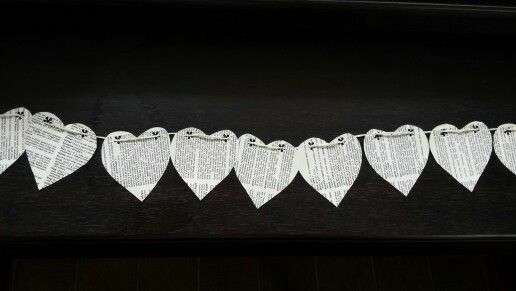 Bunting – made by my daughter and me from an old dictionary from my classroom that was headed for the recycling bin. Because bunting just makes me feel good, and I like the concept of words as decoration. Some cards made by members of my Philosophy class- I gave them felt tips and 5 minutes to make a card that showed either something they think is important or what Philosophy means to them (and I was strict on the 5 minute limit). A postcard of my favourite analogy (the starfish story) which embodies my whole ethos on teaching (and life in general really), that you can always make a difference, even if only a small one. A sand timer- I carry one of these in my bag and when work, or life, gets stressful, I get it out and just breathe deeply and slowly until calm sets in. There isn’t always time for lighting a candle, and just closing your eyes and lying down is not always entirely appropriate. But sometimes I like to use this to just take a minute, literally. Sticky notes. I just love them. That is all. It has been an interesting challenge, and as excited as I am about receiving my partner’s swap box, the process of creating my own has been far more thought-provoking and rewarding than I expected. what would you put in yours?